I hate stupid. 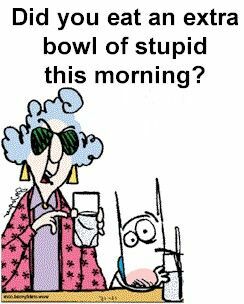 I especially hate stupid when it’s me! I’ve been on a cooking spree lately. (Yes, that’s unusual for me, especially in the summer when I make reservations!) Yesterday I yearned for something blueberry. Anything blueberry. I thought about pancakes but made muffins instead. I have a recipe I like. It’s not real sweet and has lots of blueberries. (Don’t you hate when you buy a muffin and they have two dried little things in a huge muffin?) It was going well. Or so I thought. Muffins aren’t complicated. You don’t need a mixer. After I put the pan in the oven I realized that the measuring spoon I used was ½ tablespoon instead of a teaspoon. There are three teaspoons in a tablespoon. My recipe called for 2 teaspoons of baking powder and I put in three. Instead of rushing to the internet to see what would happen, I decided to see if I could taste a difference. I couldn’t. I thought it needed salt which isn’t called for at all. What I did next was very ‘merican! I blamed the manufacturer of the stupid measuring spoons (using some bad words). Who makes a half tablespoon as part of a group of spoons? I don’t have a recipe that calls for a half tablespoon! It definitely couldn’t be my fault for not checking! Or could it? The recipe satisfied my craving. I’m happy so I’m not going to torture myself. I also made creamed cucumbers and they are the best ever! That evens it all out (in my head). I love summer when the fruits and vegetables are fresh. I especially love when I have the ambition to do something creative. All good. Carry on! This entry was posted in Aging Gracefully, Humor, Life at Home, Stupid People and tagged blueberry muffins, Cooking, cravings, mistakes, recipe adjustments by Kate Crimmins. Bookmark the permalink. I need to pay attention! They were good! I had an urge to bake cupcakes also. Think it’s a virus? I saw some watermelon cupcakes and thought they were so cute. I had to use strawberry as there was no watermelon mix, I used tiny chocolate chips for seeds, and green decorator frosting as I could not find green food coloring. They were cute, but so sweet they hurt my mouth. I ended up taking them to church for coffee break. They will eat anything. That’s one thing I miss about work. They ate anything there! I bake all the time, but watch out when I do something in the evening! Something bad is bound to happen, and the worst part is, there is no one else to blame. I begin to go stupid every evening beginning at 6 pm. Yep, like clockwork. Not good at night either. Must be first thing in the morning or I risk missed ingredients. At least you were paying attention and used baking powder instead of baking soda as I did the first time I ever made blueberry muffins for a Brownie bade., Dad was a champ – ate them anyway. (Trade negotiations are slowing exporting of food and there are stockpiles of food waiting? But – why? with as many people that are going hungry every day in this country, why doesn’t our gov. buy the farm produced foods and hand the food all over to food banks, meals on wheels, and places like schools (who are serving 1-2 meals a day free for kids here in summer as they always do – $1.00 for any adult who shows up this year – that was free last year, too. Stupid just seems to be getting stupider. Locally our food bank puts out notices that folks with gardens should drop off fresh produce. That’s a great idea. I remember when I worked, gardeners hauled in cucumbers and tomatoes beyond what was taken by coworkers. Lots of kids go hungry and my heart goes out to them. We weren’t very well off but I never went hungry. Mom had a humongous garden and lots of fruit trees. They don’t make people like my mom anymore though. Dad always had a huge garden after he retired. Loved to watch stuff grow – and a bunch of that ended up in one of 2 food banks in their small town – even small towns have people in need. If it wasn’t for a good steak and occasional burger (and maybe bacon) I’d be a vegetarian. They certainly name them right when you buy them. Blueberry Muffins, generally means I get ONE blueberry in the muffin. True, never in the plural! 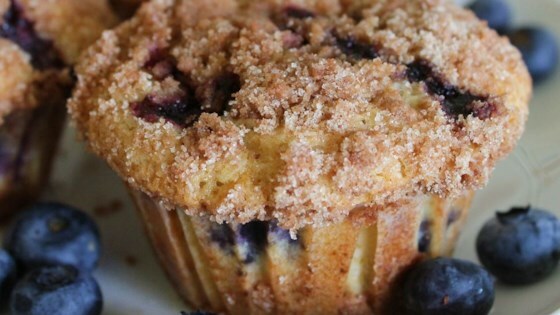 I love blueberries, and, like you, I want lots of them in a blueberry muffin. Yours look delicious! I’m enjoying the cherries this year, although I eat them with a little bit of sadness. We have lots of cherry farmers in Eastern Washington where my daughter lives, and they’re in trouble this year because of the Trump tariffs. They export a lot of cherries to China. I heard he was giving special payments to farmers affected by the tariffs. Hope the cherry guys get some. None of this makes sense. I love cherries too. I heard a complaint that the special payment would only go to cereal growers. Nothing for fruit, fish, lobsters, etc. The problem there is that fruit and fish are very labor heavy, meaning lots of low-wage people will be out of work. I’m not sure what he was thinking. More people are hurt than helped. LOL! Sounds like it all worked out OK anyway, so call it a win! I thought they were good and that’s all the counts! I have to admit that I burnt slice-and-bake cookies once, and I still will never win any baking prizes. You did not even have to slice those refrigerated cookies, just peel them apart as they were scored. I was ashamed. Don’t feel bad. I consider myself a good baker (when I remember to put all the ingredients in). My granddaughters visited a couple of years back. I thought instead of making cookies from scratch, I’d get pre-made ones just like the ones you had. Burned them. Just the bottom. The top never browned. No shortcuts in life and cookies! How long have you had the spoons? Just wondering how often you may have used the 1/2 tbsp thinking it was a teaspoon? I have never heard of a 1/2 tablespoon! How weird! I’m going to throw it out. I don’t ever use it and it can certainly slip me up. Looks very similar to the 1 tsp spoon. I’ve never seen a 1/2 tablespoon measure… wouldn’t the recipe just call for 1 1/2 teaspoons? We have some frozen blueberries from last year’s harvest in the bottom of our freezer. When it cools down a bit, I think I’ll encourage my hubby to make some muffins. We missed this year’s first harvest since we were away but our three bushes are working on another batch right now. If the birds don’t get them first, we’ll be in blueberry heaven! I tried growing them for a few years. I always lost out to something. One day they were there. The next I came with a pail and they were gone. I even tried netting but they got under it. We finally built a cage around our bushes… unfortunately, some varmint chewed a hole in the wire. I don’t mind sharing a bit, but they don’t understand the concept, apparently. chewed a hole in the wire? Yikes! I have one set of measuring spoons that have a half tablespoon and I have NEVER seen a recipe calling for that measure. You’re right – it is stupid. I am going to remove it from my set right now! I had a taste for blueberries this morning too – and made pancakes. They were just ‘meh’. I don’t know what I did differently … but I like your line of thinking. It couldn’t possibly be my fault. I blame the blueberries. 🙂 It’s the ‘merican way! I will eat one for you! 🙂 I have a few that have the measurement worn off. I should throw out. This one was clearly marked. This has been a particularly stupid month for me. I’m hoping it gets better in August. I have those months too. A half tablespoon? Never seen such a thing. It’s wrong on so many levels. It’s just that sort of stupid thing that causes sane people to be irrational. And it can wreck a batch of something! You got that right! If there is one thing I hate it’s too much salt! We’ve stopped eating at restaurants where the kitchen is too heavy handed with the salt. I love “salty” but too salty is inedible. I like salt too but there is such a thing as too much. I used to have a baking session once a month to make nothing but pies (I baked cakes every week). Fruit pies that is, and would freeze them down. I don’t bake much these days, and cooking this week has been microwave as it’s quick and not draining! This is unusual for me in the middle of one of the hottest summers ever! Me too! Hate to waste blueberries! Creamed cucumbers? I love cucumbers, especially covered with ranch dressing. My Mom made the good old cucumbers with onions, salt, pepper, sugar and vinegar. I loved them but haven’t been able to make them as good as she did. I don’t know why, but blueberries don’t make me smile. Love peaches when they are so sweet and juicy that they drip down your arm when you bite into them! There aren’t many fruits I don’t like. Blueberries can be tart if they are not good. If you throw in sour cream and cut back on the sugar and vinegar you have creamed cukes. Ok…I too had a ridiculous blueberry craving! Mine was actually for blueberry anything, with lemon icing! It happened because I have been reading a series books by Joanne Fluke. Her main character is a baker…each book has recipes… But, I, unlike you went to the store to buy something blueberry with lemon. The only thing I could come up with was a blueberry bread (just like raisin bread, but with blueberries) and Pepperidge Farm lemon cookies! Pathetic!!!! OMG! I’m reading Joanne Fluke too and I blame her for my recent rash of baking! None were her recipes but it gets you in the mood. I can’t believe how many cookies her characters eat. I’d weigh 800 pounds! I have no idea why they make 1/2 tablespoons, either. Yes, we have one. No, I never use it. I find recipes that ask for 3 tsps funny, too. That’s weird. They could just say 1 tablespoon. Then again, what’s the fun in that. Glad the muffins still turned out. Blueberries are so good! They were great. Still are…I have several left. 🙂 A great breakfast treat! I just had one! Yum! You should advertise for that. None of my cats are interested unless it involves tuna. I’m with you, I hate it when I have to look with a magnifier for the blueberries or a another filling. maybe this store-bakers can need this half tablespoon for the blueberries ( a half tablesoon for a dozen muffins of course). Mr. stupid celebrated a party in my kitchen as I made jelly donuts once with a (huge) lot of jam-filling… that hellions broke apart in the hot oil and the jam with the seeding oil caused a lot of mess… maybe I can sell the recipe to our war ministry, it makes a mighty fine bomb…. 🙂 I love your cooking experiences! I thought you put the jelly in after you cook them but then again, I never made them. Jelly bombs! What would be an awesome war. I enjoy baking during the winter months. Over the summer, about as creative I get in the kitchen is cutting a cantaloupe. I did recently purchase some blueberries from a local farm. They were huge and the sweetest I’ve ever tasted. The fruit I’ve had (maybe with the exception of strawberries) are very sweet this year. Our peaches are good. Cherries wonderful. Blueberries yum! Even the later watermelons are good. I think the earlier ones came from Hades. Bleah!